The modern retail system has worked to dazzling effect. From the 19th century, store owners emerged from small beginnings to set in train an industry that has seen some operators become nationally, even globally, dominant. Along the way, they turned retailing into an art, and then a science. Now retailers in emerging markets appear to be repeating the story all over again, except on a scale and at a speed beyond anything we have seen before. Given all of this, it can be hard for those who work in retailing to accept that the industry as we know it is living on borrowed time, on the brink of transformation. There is now an urgency with which conventional store-based retailers must now act and the extent of the challenges this change represents in strategic, organizational, and above all, technological terms. Reshaping Retail sets out the driving causes, current trends and consequences of a transformation in retail triggered by technology. The changes go far beyond making items available for sale on the internet. Starting by briefly setting the historical and business system contexts for retail and describe the role that technology has played in the creation of modern retail it then explains the underlying technological drivers behind the current revolution – radical changes in the capacity of both hardware and software, mobile telecommunications changes and the advances of the Internet. Ultimately, success will hinge on more than competence; it will come down to a way of thinking. Customer-centricity will need to be valued not just by the store owner, as in the past, but also by all employees in the organization. It will need to become embedded in their daily tasks. The same applies to technology, which must be at the center of the organization and recognized as such by everyone. 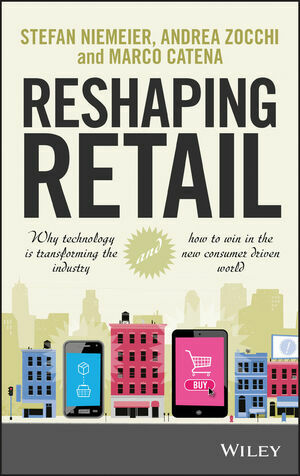 With a combination of extensive desk and field research, interviews with leading retailers and technologists, together with the real world experience of practitioners in this area, Reshaping Retail will inspire and help store retailers to make the necessary transformation now to win in the new consumer driven world. Stefan Niemeier is a Director of McKinsey & Company and leads its European “Technology in Retail” group. He has advised retailers around the globe and across many retail sub-sectors. Stefan holds a PhD in Economics and a Master in Business Administration. Andrea Zocchi is a Director of McKinsey & Company where he leads the Consumer Practice in Southern Europe. Andrea is also an adjunct professor at IMT - Institute for Advanced Studies - in Lucca (Italy), where he holds a course on advanced problem-solving techniques for PhD students. Andrea holds a degree in Mechanical Engineering and prior to joining McKinsey, he worked for Hewlett Packard Italy. Marco Catena is an Associate Principal of McKinsey & Company. He works with retail and mobile telecommunications players on commercial and performance transformation topics. Marco holds a PhD in Industrial Management and a Degree in Management Engineering.